Frances Ruffelle was the original Eponine in Les Misérables 25 years ago and has recently has starred as Roxie Hart in Chicago. She is currently appearing in the musical Pippin at the Menier Chocolate Factory. For one night only on Sunday 12th February at 7:30 pm she is performing her show Beneath the Dress at the Menier. 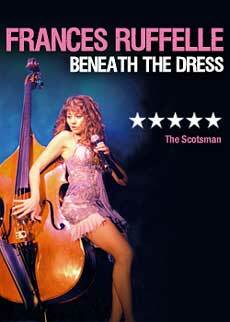 Following a successful stint at the Edinburgh Festival, Frances Ruffelle presented Beneath the Dress at the Garrick Theatre.The concert is an exploration of her musical influences with songs by Cole Porter, Duke Ellington & Kurt Weill, plus lesser-known song writers whose work has inspired her.